Premium CHIRP and Scanning Sonar Module. Premium remote network sonar solution: Includes true dual-channel 1 kW CHIRP, plus CHIRP SideVü and ClearVü scanning sonar for the clearest images on the water (transducers sold separately). Provides serious sports: fishers outstanding fishfinding and bottom tracking capabilities. Depth capability to 5,000 feet: The GSD 25 premium sonar module is a remote network solution that provides outstanding fishfinding and bottom tracking capabilities. It offers dual-channel 1 kW CHIRP, plus Garmin CHIRP ClearVü and SideVü sonar scanning for the clearest scanning images on the water. The images sent to your compatible Garmin chartplotter have target details so clear and precise, you can actually distinguish between small and closely spaced fish at key fishing depths all the way down to 5,000 feet. True Dual-Channel 1 kW CHIRP: CHIRP is the most sophisticated sonar technology available for use by the fishing and boating public. CHIRP is an acronym for Compressed High-Intensity Radiated Pulse. What it means to you is much better target resolution, clarity and crispness than any other sonar system. 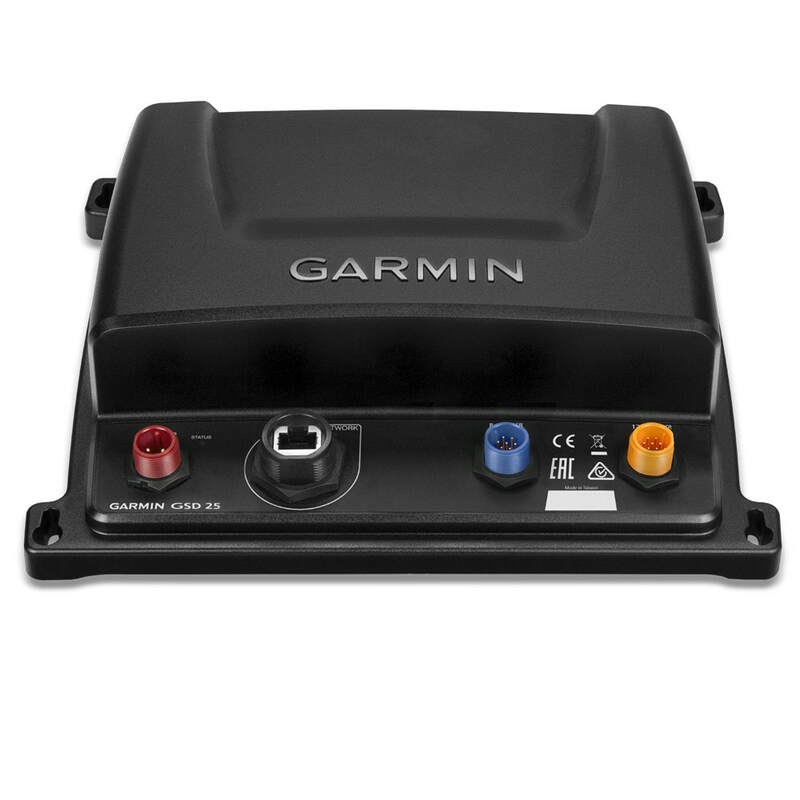 Having Garmin true dual 1 kW CHIRP as your traditional sonar allows you to adjust CHIRP frequencies to low/medium, low/high, medium/high to further optimise your sonar performance. Transducer sold separately. Clearest Scanning Sonar Images on the WaterAdding CHIRP technology to ClearVü and SideVü scanning sonar further enhances the resolution, target separation and clarity of the sonar images of fish and structure that pass below and to the sides of your boat. Built-in to our new GPSMAP xsv combos and GSD 25 Premium Sonar Module, it uses 1 transducer for traditional CHIRP HD-ID sonar and CHIRP ClearVü and SideVü scanning sonar. Transducer sold separately. Choose a Garmin Transducer: This new sonar is so unique we have developed our own proprietary transducers that are specially designed to work with our new sonar to provide the very best performance. See our Transducer Selection Guide to find a transducer that's right for you.